Properly-installed gravel driveways can last long – up to 10 years – given that it is regularly maintained. Variations shelf life will depend on the slope, curves, stability of sub-grades, and climate. 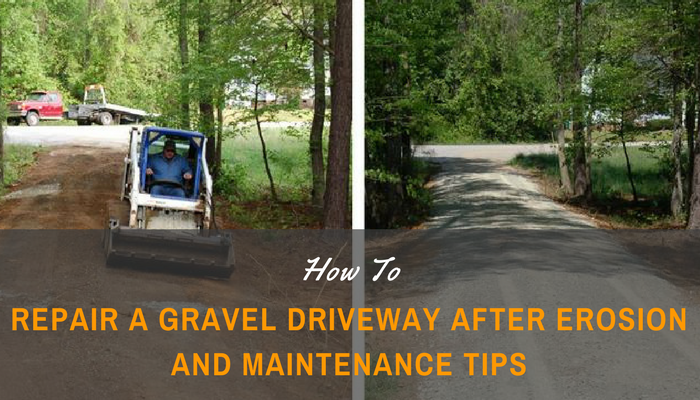 Maintenance requires repairing your gravel driveway once in a while due to heavy rain or snow. Gravel driveway repair cost by hiring a repair company can reach up to a thousand dollars. This cost is applicable to 12 feet x 25 feet driveways with at least 4 inches of gravel height. If this is too costly for you, you can do a DIY by doing the steps below. Get the crown in shape. If water is sitting under the gravel surface or the surface is too sloping, the tendency is for the gravel to be washed away either by a passing vehicle or by heavy water downpour. Even the grade by raking the gravel from down the slope. For potholes, move gravel to these spots. If the piles to be moved are too heavy for your rake, use a big shovel. The recommended pitch on the center in contrast to the sides is ½ inch per foot of the roadbed. This means that for a driveway with a width of 20 feet, the center line should be higher than the edges by about 5 inches. ​If the crown is kept in this form, you can be sure having fewer problems with potholes and other breakdowns on the surface. Since it will be impossible to recover all the gravel that was lost, you should buy more gravel. For potholes, it might be better to buy fine or coarse gravel depending on the need. Make sure it is a little bit weighty to be able to make more compact patches that are erosion-resistant. Remove Debris - Remove loose stones, remaining gravel, and soil from the holes. If there are loose sides, strengthen the edges by cutting the holes straight down, making it easier to work with loose edges. Fill the Holes – Fill the holes with gravel up to about 3 inches beneath the driveway’s level. Tamp the gravel down by using a homemade tamper, which can be prepared by attaching a small piece of plywood to the end of a 2 x 4. Compress the Patches – Run your car tires over the repaired holes. A few runs will be sufficient to fill the small unfilled spaces underneath. Tamping down is the next step, but it need not be like the one that the highway state department is using for public roads. They use rollers to compact because they have rollers. Driving up and down be enough to compact your gravel driveway. Consider using a wooden bolster. If you don’t have wood, use anything that’s flat and hefty, but not one that can forcefully spread the gravel again. Repeatedly bolster onto the surface. That can ensure no space under is left unfilled and that stone pieces are held strongly together. Down-pressure maintenance is necessary. Take note that roller services are not that expensive. It also does a great job on a long drive and it can make for a durable, long-lasting surface. You can hire a professional once every five years just to make sure it is always ready for the harsh seasons. Others use their blades four times a year for maintenance. That can also help keep the huge bumps out and bring large gravel pieces back to the driveway surface. Water control – If ruts, brims, and washouts are common occurrences on your driveway, then you have a drainage issue. Try increasing its height by adding more gravel. Installing a ditch on the sides can also help pulling water away. Immediately fix snow plow damage – Snow plowing over your driveway can displace pieces of stones off your gravel driveway. After plowing, inspect for damaged parts, and pull stones back to their original places. This will not totally repair the damage, but it would be a great reminder that certain parts have already been compromised. Install geotextile fabric – Going deeper to check a more deeply-seated problem may help. Sometimes, it is just that the soil underneath is unstable, soggy or watery. Adding a geotextile layer might fix the problem permanently. That’s what most people do if they are not ready for an upgrade to concrete or an asphalt driveway. Install Edging – Thinking about edging the driveway may give many benefits. Apart from preventing gravel from getting scattered, edging can boost the appearance of driveway, yard and garden and consequently improve the value of your property. Sometimes, any of those mentioned above will not suffice, and you’ll need to make a complete overhaul. This might be the best option if the potholes appear to be beyond repair and weeds begin sprouting everywhere. A temporary quick-fix might not be the best idea if that is the case. When you work with nature, you’ll find better solutions to the problems, and thereby preventing them from recurring ever again. Ensure that water courses are diverted away from your drive quickly. This will reduce impact and cost. Work with the natural topography of the place you are living in. Study the weather and climate in the area, and make sure you know how bad things can get. Plan your project well by taking into account the natural course of water flow. It can help in the design and improving the longevity of your driveway. Follow these steps and you’ll have great looking and sturdy driveway in no time.